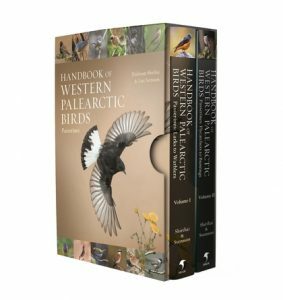 This unique and spectacular handbook is the most complete and comprehensive photographic guide to the passerines of the Western Palearctic. 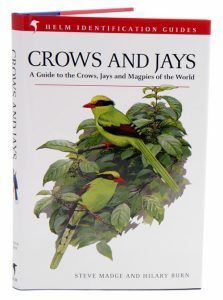 Written by two of the world’s most respected ornithologists, Hadoram Shirihai and Lars Svensson, it contains the most up-to-date information available on bird identification covering all aspects of plumage, moult, ageing and sexing, with sections on voice and other identification criteria, and detailed taxonomic notes. The exceptional text is backed up by a remarkable collection of more than 5,000 photographs, featuring a comprehensive range of plumages that illustrate every race and morph of each species in the region. 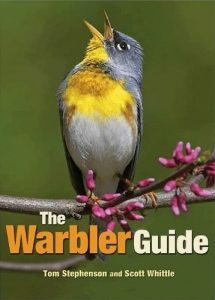 This stunning handbook will be the definitive reference for the region for years to come – no birder’s shelf will be complete without it. Artist/Author: Black, Andrew and Peter Gower. 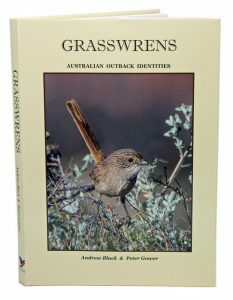 Within this book, there are more than 100 brilliant photographs illustrating all 11 presently recognised species and all subspecies, a total of 25 different grasswrens, together with the environments in which they live and maps of their distribution. The authors believe that the numbers 11 and 25 will not be the final totals and provide evidence for that belief. Provides a natural history of grasswrens in Australia followed by details of each species. Artist/Author: Coate, Kevin and Lance Merritt. This book provides a rare insight into the far north of Western Australia, the capture of over one million wild finches, their marketing and their distribution around the world. It is the first complete analysis of lawful, and sometimes questionable, trapping and trading of Australian wild birds, and the operations of authorities who allowed the industry to linger in Western Australia between 1897 and 1986. The work redresses the void of published information relating to the capture of wild finch species found in the Kimberley District of Western Australia, the trappers themselves and their methods, those trading in finches and some statistical data. The Red-eared Firetail, an Estrildid finch endemic to the South West of Western Australia, is also included in this work. The book reflects the pioneering spirit of early settlers, explorers, scientific specimen collectors, and adventure seekers who visited or resided in the remote north of Australia. All were bushmen with exciting tales of hardship and observations that enthralled urban dwellers. Initial trapping supplied European markets, which gave way to domestic markets after the Second World War. In Australia finch trapping and commercial avicultural trading peaked in the late-1950s, remained strong until the late-1990s and then waned. 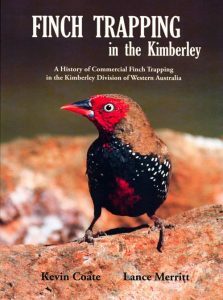 It has detailed coverage of the birds affected, individual stories of over 150 men and women touched by the trapping industry, the role of Aboriginals and historical aspects of Kimberley life, with over 1,600 source references for researchers. Artist/Author: Clement, Peter and Chris Rose. 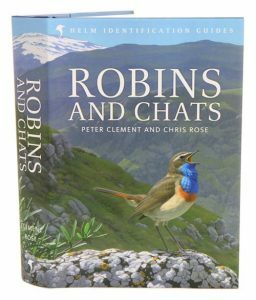 This authoritative handbook, part of the Helm Identification Guides series, covers in detail the world’s 175 species of robins and chats. Formerly considered to be part of the thrush family (Turdidae), this large group is now usually treated as separate family, Muscicapidae, together with the Old World flycatchers. The vast majority of species are Eurasian or African, with only a handful of species straying into the New World or Australasia. The Australian Robins, although superficially similar, have long been regarded as a separate family and are therefore not included in this monograph. Robins and chats are a diverse family comprising both highly colourful and visible species, such as the robin-chats of Africa, as well as some of the most skulking and elusive birds, such as the shortwings of Asia. Many chats, such as the well-known Nightingale, are renowned songsters, and a good number are highly sought-after by world listers for their extreme rarity or simply because they are hard to see. 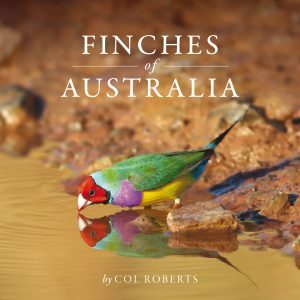 This book discusses the identification and habits of these birds on a species-by-species basis, bringing together the very latest research with accurate range maps, more than 600 stunning colour photographs that illustrate age and racial plumage differences, and 64 superb colour plates by the internationally renowned artist, Chris Rose. This authoritative and sumptuous book will be an essential purchase for all chat enthusiasts, and will become the standard reference on the subject for many years to come. Artist/Author: Marzluff, John M. and Colleen Marzluff. Twenty years ago, fresh out of graduate school and recently married, John and Colleen Marzluff left Arizona for a small cabin in the mountains of western Maine. Their mission: to conduct the first-ever extensive study of the winter ecology of the Common raven under the tutelage of biologist Bernd Heinrich. Drawing on field notes and personal diaries, they vividly and eloquently chronicle their three-year endeavour to research a mysterious and often misunderstood bird – assembling a gigantic aviary, climbing sentry trees, building bird blinds in the forest, capturing and sustaining 300 ravens as study subjects, and enduring harsh Maine winters in pursuit of their goal. They also share the unique challenges and joys of raising, training, and racing the sled dogs that assisted them in their work. Accompanied by Evon Zerbetz’s lovely linocut illustrations, this is a fascinating, behind-the-scenes look at the adventures of field science and an insightful exploration of the nature of relationships, both animal and human. Artist/Author: Stephenson, Tom and Scott Whittle. 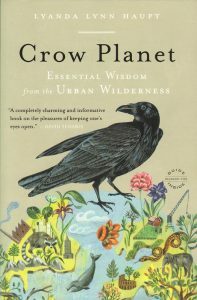 With more crows now than ever before, this abundance is both an indicator of ecological imbalance and a generous opportunity to connect with the animal world. This book reminds us that we do not need to head to faraway places to encounter ‘nature’. Rather, even in the suburbs and cities where we live we are surrounded by wild life such as crows, and through observing them we can enhance our appreciation of the world’s natural order. 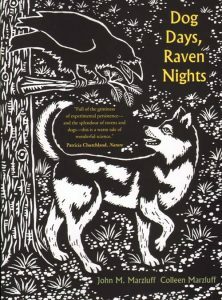 This book richly weaves Haupt’s own ‘crow stories’ as well as scientific and scholarly research and the history and mythology of crows, culminating in a book that is sure to make readers see the world around them in a very different way. Artist/Author: Attenborough, Sir David and Errol Fuller. recognised and commemorated in the first name that they were given – birds so beautiful must be birds from paradise. 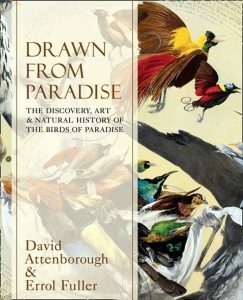 In this unique exploration of a truly awe-inspiring family of birds which to this day is still shrouded in mystery, Sir David Attenborough and Errol Fuller trace the natural history of these enigmatic birds through their depiction in western works of art throughout the centuries, featuring beautiful illustrations by such luminary artists as William T. Cooper, Jacques Barraband, William Hart, John Gould, Rubens and Breughel, to name but a few. Experienced ornithologists and general nature and art enthusiasts alike will delight in this journey of discovery of the world’s most beautiful and mysterious birds. Artist/Author: Madge, Steve and Hilary Burn. There are 120 species of crows, jays and their allies in the world today. Many are exceedingly beautiful in colour, grace and form, whereas others are black and somewhat sinister in appearance. In no other group of perching birds has evolution produced such a degree of variation, from the tiny Hume’s Ground-Jay of the steppe-highlands of Tibet to the huge Thick-billed Raven of the mountains of Ethiopia. The 30 superb colour plates by Hilary Burn in this book depict them all; each plate is accompanied by an informative caption page summarising the criteria required to identify the species, alongside colour world distribution maps. Some of these birds, bearing such evocative names as the Banggai Crow, Mesopotamian Crow and Flores Crow, have never been illustrated before. The authoritative text by Steve Madge treats each species in depth, summarising identification techniques and concisely reviewing all aspects of corvid behaviour, distribution, population and taxonomy. 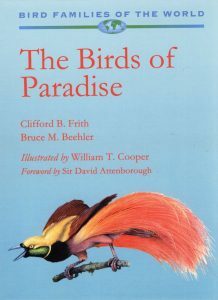 The author has had first-hand experience of most of the species during his travels throughout the world, travels in which he gradually became fascinated by this very special, but somewhat ignored, group of birds. Artist/Author: Laman, Tim and Edwin Scholes. 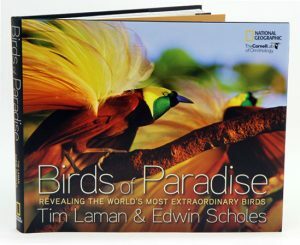 Photographer Tim Laman is the first person to photograph all bird of paradise species and probably also the first person to see all species in the wild. Legendary naturalist Alfred Russel Wallace once observed, “The bird of paradise really deserves its name and must be ranked as one of the most beautiful and most wonderful of living things.” In this dazzling photographic essay, Tim Laman and Edwin Scholes explain why, presenting gorgeous full-colour photographs of all 39 species of the Birds of paradise that highlight their unique and extraordinary plumage and mating behaviour. The authors take you into the depths of the remote New Guinea rainforest to find each of these birds, some of which have never before been photographed. In pursuit, the authors pose answers to questions raised by eminent evolutionary biologists such as Ernst Mayr: “How can natural selection favour, one might almost say permit, the evolution of such conspicuously bizarre plumes and displays? How can it permit such ‘absurd exaggerations’, as one is almost tempted to call them? How can it happen that apparently closely related species and genera differ so drastically in their habits and colorations?” Field notes, conservation success stories, and observations of native peoples’ interactions with these magnificent birds provide a rich feast for birders, naturalists, and any one who is seduced by the power and majesty of the natural world.